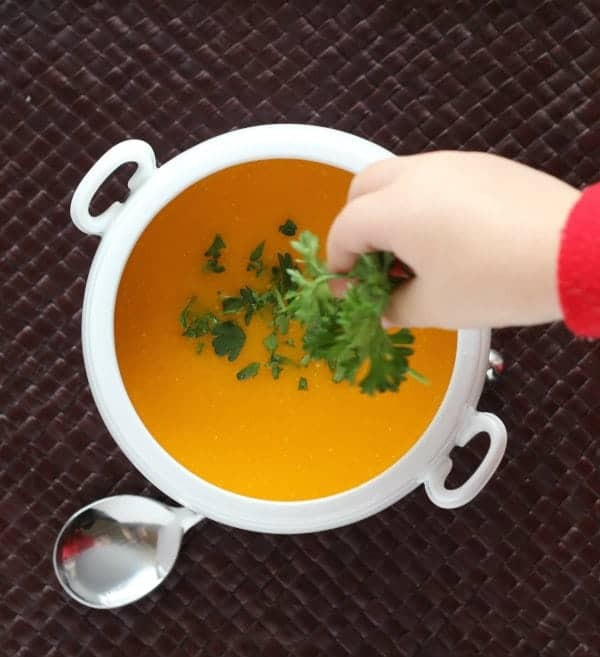 This shortcut squash soup is ready in just 20 minutes – but you won’t miss out on any flavor, this soup is packed with nutrition and flavor. We’ve talked about how much I hate peeling squash. My good friend Liz of The Lemon Bowl was recently here with a solution, great butternut squash soup that doesn’t require the risk of losing a finger. However — I made it even easier. You don’t get the great depth of flavor from roasting the squash, but this makes a great weeknight meal or a quick lunch when you’re craving something hot, easy to prepare, and good for you. Plus, there is great flavor from the cumin. One of my favorites. It’s still super flavorful and it comes together in 20 minutes. 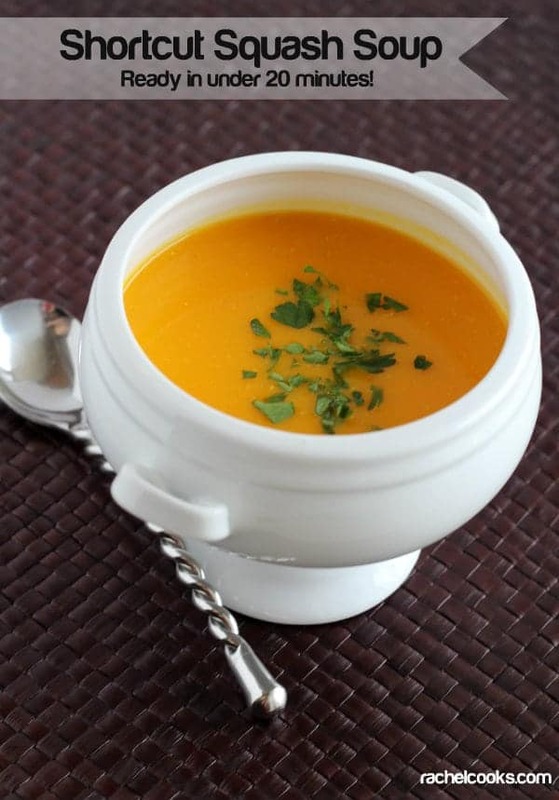 You really can’t beat this shortcut squash soup. It’s great on those days when you’re feeling uninspired around lunch time. It starts with a little rectangular package of squash. (Side note: that same squash also makes an amazing healthy queso dip – don’t just take my word on it, TRY IT!) It can even still be frozen, it will heat up on the stove. Throw that in the pan, add some broth and cumin. Stir in some Greek yogurt at the end for a nice creamy result – with no guilt! That’s it! This shortcut squash soup is great topped with parsley if you have some in the fridge, or cilantro would be good too. The little pop of freshness from the herbs really brightens up this soup. 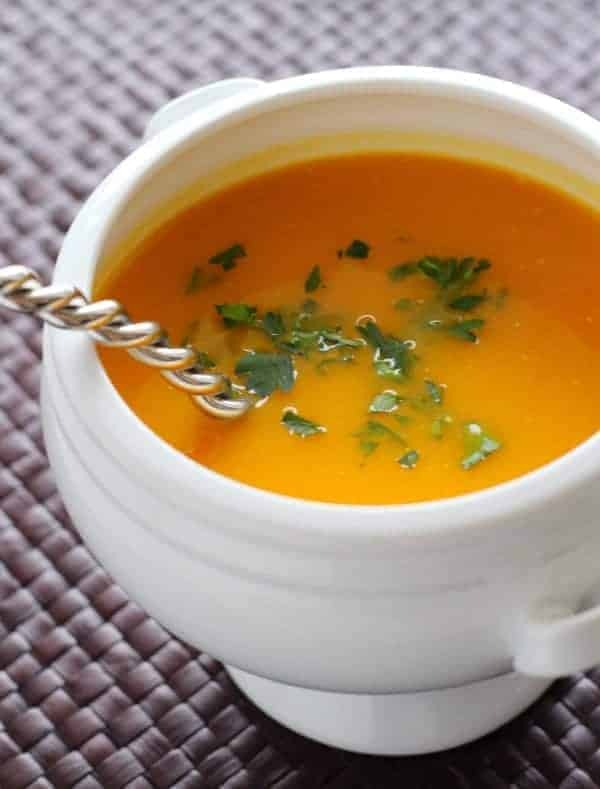 This squash soup is ready in just 20 minutes! Combine squash, chicken broth, cumin, salt and pepper and in a medium saucepan and heat over medium heat until squash is thawed and all ingredients are hot. Remove from burner, whisk in Greek yogurt. Check seasonings and add salt and pepper as needed. Verdict: Simple, delicious, and you can feel good about yourself after eating it. Husband’s take: I made this shortcut squash soup for lunch for myself, so he didn’t actually get a chance to try any. E thought more parsley was needed. Craving some more great soups? 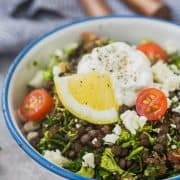 Try these: Pancetta and White Bean Soup with Kale, Red Lentil Soup Recipe, Creamy Tomato Soup with Whole Wheat Orzo, Roasted Cauliflower Soup with Cheddar, or check out my complete collection of soup and stew recipes. This had very little flavor. Thanks for the feedback. It is a simple, straightforward soup with a short ingredient list. You could try adding more cumin if you’d like. You also might like my Panera squash soup copycat. Hi Cait! I recalculated and the numbers look a little better now! :) I removed the “salt to taste” as that can sometimes make the numbers go crazy. Hope this helps! (PS: The nutrition info is part of the recipe card now). From the picture, it really looks at though you’ve blended the soup, yet there is no direction to do so. Is this creamed in a blender? 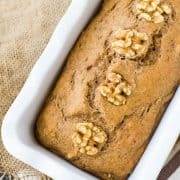 I actually used frozen pureed squash in this recipe (it comes in a square package in the freezers) but that should be specified in the recipe, so thank you for pointing it out! If you can’t find that, then yes, you’ll have to puree the soup. Don’t know what I did wrong. Soup curdled after I took it off the bburner and added the greek yogurt. Had much better luck on a previous quick sould with only 1 cup broth and cream instead of yogurt. Still asking — why did my soup curdle? Sorry to hear that! Next time try letting it cool just a bit before adding the yogurt. Yogurt can be so temperamental in hot dishes. I make a Butternut Whiskey Soup and discovered, like you, that the frozen package of squash worked beautifully. I could not tell a difference between the two and am thrilled that I no longer have to risk serious injury peeling them. 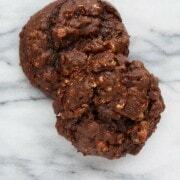 I have truly enjoyed reading your recipes and getting to ‘know’ you, through them. God has truly blessed you! Using Greek Yogurt instead of cream here is a superb substitution….so is finding a way to do great butternut squash soup in under 20 minutes! Well, I’m always about easier! Especially with two kids!! such a smart idea Rachel. Where do i get that frozen squash??? 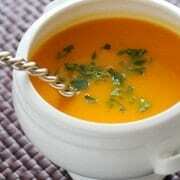 Squash soup is new to be this winter, love this quick version. How cute is E helping style your pics! yum! i love a quick and easy soup! I’m all about easy these days! And I love the little hand picture – too cute! I hate peeling squash too! It’s so time consuming and when you are short on time you detour to another vegetable. 6 ingredient soup! I LIKE! Ps… those are cutest little fingers EVER! How easy this is! Love squash soup but also hate peeling it. This is great! I love that you made butternut squash soup even easier!!! I actually have never used frozen squash – not sure why?!? !